In recent decades, Saudi Arabia has committed itself to playing the part of mediator in intra-national and international conflicts in the greater Middle East region. Examples include the two Saudi-introduced Arab Peace Initiatives of 1982 and 2002, mediation attempts between Algeria and Morocco in the West Sahara conflict, Iraq and Syria during the Iran-Iraq War and Iran and Iraq towards the end of their military conflict. Saudi Arabian Foreign Relations provides a new insight to current studies on Saudi foreign policy and mediation in international relations. The book offers a detailed analysis of Saudi Arabia’s intermediary role in the intra-state conflicts in Yemen, Lebanon and the Palestinian territories, and the successes and limitations of each. Additionally, it provides an updated examination of Saudi Arabia’s role towards resolution of the larger Arab-Israeli conflict. Saudi Arabian Foreign Relations contributes to a far deeper understanding of Saudi foreign policy, and therefore will be of great interest to students and scholars of Middle East Politics and International Relations. 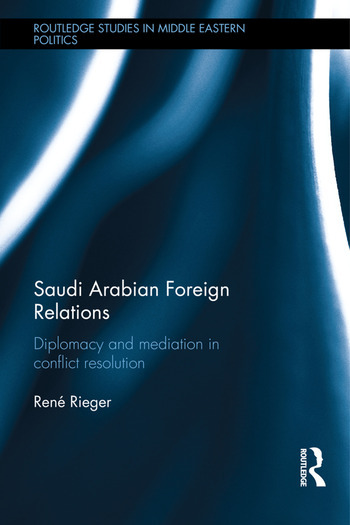 Rene Rieger is Chairman of Middle East and International Affairs Group (MEIA Research).